Wondering what to do with left over lunch bags, or the slightly larger ones from that take-out order from last night's dinner? 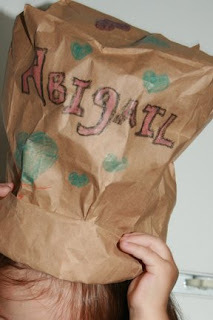 Make a paper hat for your toddler. Let her color it as much as she wants and then roll down the top to make the brim. I made this one last summer before Abigail was really into coloring, so I did the decorations myself. She's very much a hat girl now. I think we need to make another one soon. This reminds me of a good lesson. I am a teacher and I will have my students make paper hats!